Quick, simple and cost-effective to use, the dry wall liner is suitable for internal use in all commercial and domestic applications. 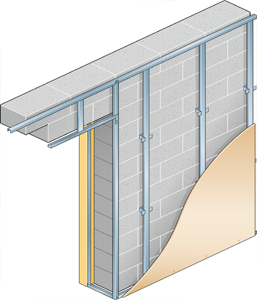 It can be used to dry line masonry backgrounds, uneven walls or walls with surface-fixed services, for concealing services, cavity walls and where the cavity width between the wall and the back of the plasterboard lining ranges from 25 to 175mm. By replacing the wet trade alternative, this quality system offers practical, cost-effective lining to meet the needs of fasttrack building methods. It also has a low thermal capacity with a crack-resistant surface so paint or ceramic tiles can be applied directly. Compatible with all partition and suspended ceiling systems, wall liner can be used with a range of Gypsum wallboards and thermal laminates to line brick, block and concrete walls that are reasonably dry and protected within the building envelope.